One of my favorite ways to learn is through travel. Whenever I get the chance, I hit the open road and travel to someplace new. In the summer of 2009, my family and I took the ultimate road trip: Mount Rushmore and Yellowstone. As we were returning to Denver from Grand Tetons National Park, we passed through the Shoshone Reservation in central Wyoming. There we visited Sacagawea's grave. This blew my mind. A widely accepted story goes that Sacagawea died of an illness just six years after returning safely from the Lewis & Clark expedition. 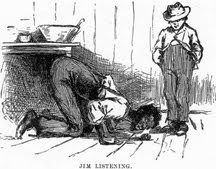 But the Shoshone on the Wind River Reservation insist on a different story. They claim that Sacagawea eventually left her abusive French husband, Charbonneau, and returned to her people--including her brother Cameawhait, with whom she had been reunited on the expedition. The have pictures at the museum there of a wrinkled elderly woman, taken around 1884, at which time Sacagawea would have been 96 years old. They told stories of her, and had marked her grave and that of her son, Jean-Baptiste (his burial here is also under dispute). 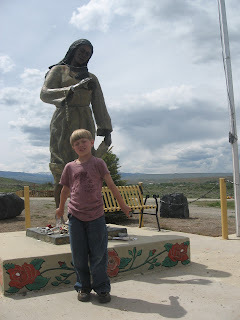 My son, Owen, is in front of a statue of Sacagawea at the grave yard. She holds in her hand the seashell that she brought back to her people from the Pacific Ocean. (She also saw a beached whale there.) Notice behind her the high, wind-swept plains. The reservation is far from the tree-covered slopes that the Shoshone occupied at the time of Lewis & Clark. 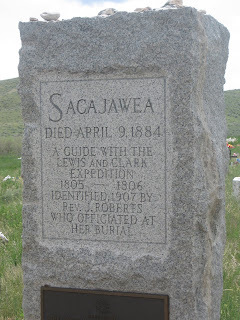 This is the gravestone of Sacagawea. A stone for Jean-Baptiste is located right next to it. What do you think? Could Sacagawea have survived into her 90s--to see a time when her people were confined to a reservation? Or did she die in 1809, leaving Jean-Baptiste and her newborn daughter, Lissette, in William Clark's care? this is interesting as I am now almost 56 and when I was 9 nwe also traveled through that same area-my last name is Charbonneau. We too stood at the gravesite way back then . and your photo of the stone marker is setting right off of the road if I remember correctly. also it is not too far from casper wyoming are too the memory that I have. am I close on my memory?